Welcome to Palazzo! 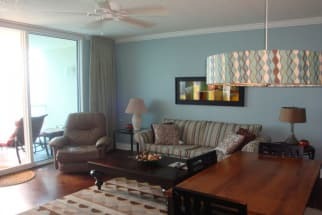 Emerald Coast by Owner is happy to offer you a number of properties within this gorgeous beachfront condominium complex! This massive resort offers you 1, 2 and 3 bedroom condos along the coast, all equipped with large properties, beautiful views, granite kitchen countertops and so much more! Amenities at the resort include heated gulf front pool and spa, fitness center on the gulf front, 3 high speed elevators, convenient location and so much more! Even when you leave the property however, the fun doesn’t end there! Be sure to check out Shipwreck Island Waterpark, other fun parks, swim with dolphins, deep sea fish, parasail, paddle board, rent a jet ski, go on a boat tour, go golfing and so much more! There is a great shopping center in the area called Pier Park, this massive park features a large amount of stores and restaurants for you to enjoy and choose from while you shop! Scroll down to browse our Palazzo Panama City Beach listings. Refer to the contact information found on each listing to contact the property owners directly with any questions or to book your next vacation rental. ECBYO does not charge any service fees when you book with us! Book your next Palazzo Panama City Beach vacation with emeraldcoastbyowner.com!